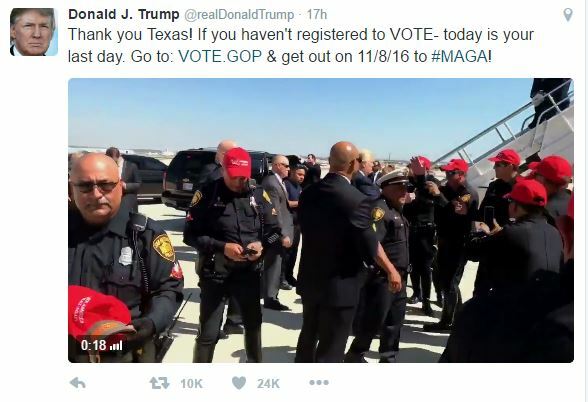 Over a dozen San Antonio Police Department officers that chose to wear the iconic “Make America Great Again” baseball caps, that have become icons of Republican presidential candidate Donald Trump’s campaign, have been punished for their choice of attire. According to San Antonio city officials city employees are prohibited from endorsing a political candidate while on duty. Mayor Ivy Taylor is one of many critics that claim the video gives the impression that the officers were supporting Trump and claims it could cause a rift between the officers and citizens who do not support Trump. President of the San Antonio Police Officers Association, Michael Helle, claims that the officers involved are all aware of the rules and were simply “caught up in the moment” after accompanying Trump to the airport as part of his security motorcade. The 14 officers involved are expected to receive written reprimands or counseling for the incident.